Siri, probably the most exciting of the new features is an intelligent assistant that allows users to control their device using their voice. Unlike most voice activation software, Apple claims that Siri not only understands the words that you say but also understands what you mean. Siri does what you tell it to do or locates the information that you request all by simply clicking on the microphone icon and speaking. Users can do things like ask about the weather, ask for directions, make calls, send messages, take notes, schedule meetings, and set reminders. The new Siri intelligent assistant software makes using your iPhone even easier. The advanced optics with an 8 mega pixel resolution, custom lens, and larger aperture offers more than 60% more pixels than the iPhone 4 camera as well as the ability to collect more light in your photos. The in camera photo editing also allows iPhone 4s users to crop images, rotate images, remove red eye, enhance, and enjoy sharper images like never before. With the iPhone 4s you can now shoot spectacular 1080p HD video. The new optics records 30 frames per second and produces vivid, high quality memories. By simply tapping the location that you want to focus in on the new video stabilizer ensures that there are no more shaky shots. Users can also edit their videos by trimming clips, adding video themes, title transitions, and even a soundtrack. The new display makes everything on the latest iPhone 100 pixels better and creates the sharpest visual experience ever on an iPhone. Whether it is text, photos, or a video the high resolution retina display performs remarkably. 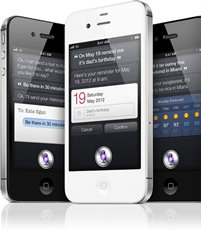 iOS 5, Apple’s new mobile operating system adds over 200 new features to the iPhone 4s. Some of these new features include a new notification center, unlimited messaging to other devices running iOS 5, Twitter integration, better reminders, the newsstand, stripped down browsing format, and a PC free wireless activation. The iCloud allows you to manage all your music, photos, Apps, mail, contacts, calendars, and documents all online. With iCloud you can wirelessly push your media to any of your devices effortlessly. The iPhone 4s is the first phone to utilize two antennas, one for transmitting and one for receiving. Switching between two antenna maximizes call quality and doubles the maximum data download speed from 7.2Mbps to 14.4Mbps. The 4s also enables roaming in 200 countries all around the world. The iPhone 4s also comes equipped with many more features like Facetime, Airplay, and Airprint. Getting back to the initial question, is it worth it? Although the 4s adds some new features, it seems that most people feel that it would be better to wait for the iPhone 5 which is expected sometime in 2012. It is new so the price tag will be high. Could only be a year away from the iPhone 5 and new features worth waiting for. The iOS 5 upgrade is free and compatible with any iPhone versions 3Gs or later. What do you think? Is the upgrade worth it, especially knowing that you will probably upgrade again once the iPhone 5 is released? This entry was posted on Thursday, October 6th, 2011 at 12:30 pm	and is filed under Technology. You can follow any responses to this entry through the RSS 2.0 feed. You can leave a response, or trackback from your own site.